Marriages of the Prince of Wales have been rare events in English history. The current Prince Charles is only the sixth to marry whilst Prince of Wales since 1501. The last one was his great, great grandfather, Albert Edward, the future King Edward VII, in 1863. Queen Victoria and Prince Albert had begun the search for a bride in 1858 since an early marriage would mean he would be able to have a son earlier to secure his reign. The bride was not allowed to be a Roman Catholic under the Act of Succession. Although the Queen and the Prince Albert were keen on finding a German match, they agreed to a marriage with Princess Alexandra Caroline, daughter of Prince Christian of Denmark, who was known to be very beautiful, charming and intelligent. 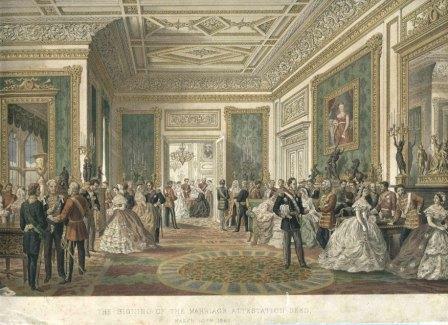 The marriage took place in ‘The King’s free chapel of St George’, Windsor Castle, on 10th March 1863. The marriage attestation deed was signed in the State Apartments of the Castle, rather than in the Chapel, as you can see in this print held in the St George’s Chapel Archives. The Chapel Archives also contain the official marriage register signed by numerous witnesses and other letters and documents connected with the wedding. These reveal the names of the important people from around the world who were invited to attend and even indicate where they were seated in the Chapel. The wedding was not open to members of the public but they were allowed to gather outside to greet the Royal couple.